The Red Ryder Roundup Parade in Pagosa Springs, Colorado. 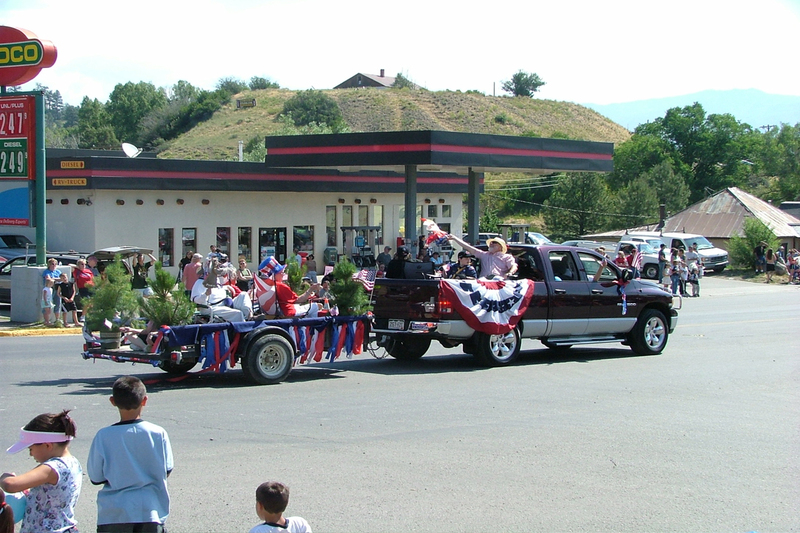 The Red Ryder Roundup has featured a rodeo, dance, parade, carnival, and fireworks every Fourth of July since 1953. Pagosa Springs (pop. 1,591) is located on the western slope of the Rocky Mountains in southwestern Colorado and is the location of naturally occurring mineral springs. The area was first discovered by Native American Ute tribes, and the name “Pagosa” was derived from the Ute word “Pagosah” meaning “healing or boiling waters.” The Native Americans believed these springs had healing and curative powers. Ownership rights and control over these hot springs was a source of conflict between the Utes and the Navajos until the federal government officially claimed ownership of the hot springs in 1880, leading to settlement of the area. The Town of Pagosa Springs was platted in 1883 and officially incorporated in 1891. At the turn of the century, the economy of the community diversified due to the discovery of gold and the extension of the Denver & Rio Grande Western Railroad, which helped establish industries including logging, mining, and ranching. In the early years of the 20th century, local residents started to promote the hot springs and the natural beauty of the San Juan Mountains and the surrounding San Juan National Forest lands in an attempt to attract tourists. Initially the strategy did not work, but more recently Pagosa Springs has become a popular visitor destination. With U.S. EPA assistance, the community has invested considerably since 1992, restoring the portion of the San Juan River that flows through downtown Pagosa Springs and creating the Riverwalk trail. In 1938 local cartoonist Fred Harman created the comic strip “Red Ryder and Little Beaver,” nationally syndicated until 1964. A Fred Harman Art Museum preserves this legacy. Inspired by Harman’s popular work, for 57 years the Red Ryder Roundup has featured a rodeo, dance, parade, carnival, and fireworks every Fourth of July.